Now, by pioneering a technique that combines genomics, single-cell analysis, flow cytometry and imaging, scientists have isolated this amazing regenerative cell—a subtype of the long-studied adult pluripotent stem cell—before it performs its remarkable act. The findings, published in the June 14, 2018, issue of the journal Cell, will likely propel biological studies on highly regenerative organisms like planarians and also inform regenerative medicine efforts for other organisms like humans that have less regenerative capacity. 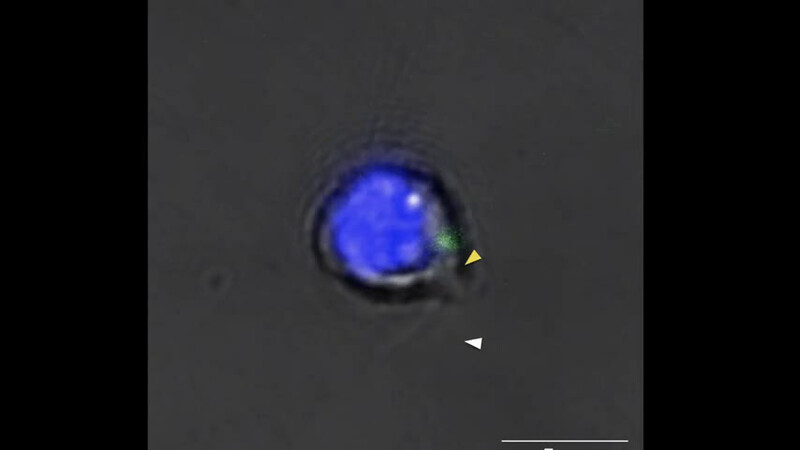 "This is the first time that an adult pluripotent stem cell has been isolated prospectively," says Alejandro Sánchez Alvarado, Ph.D., an investigator at the Stowers Institute and Howard Hughes Medical Institute and senior author of the study. "Our finding essentially says that this is no longer an abstraction, that there truly is a cellular entity that can restore regenerative capacities to animals that have lost it and that such entity can now be purified alive and studied in detail." Every multicellular organism is built from a single cell, which divides into two identical cells, then four, and so on. Each of these cells contains the exact same twisted strands of DNA, and is considered pluripotent—meaning it can give rise to all possible cell types in the body. But somewhere along the way, those starter cells—known as embryonic stem cells—resign themselves to a different fate and become skin cells, heart cells, muscle cells, or another cell type. In humans, no known pluripotent stem cells remain after birth. In planarians, they stick around into adulthood, where they become known as adult pluripotent stem cells or neoblasts. Scientists believe these neoblasts hold the secret to regeneration. Though neoblasts have been the subject of scientific inquiry since the late 1800's, only in the last couple of decades have scientists been able to characterize this powerful cell population using functional assays and molecular techniques. Their efforts showed that this seemingly homogenous cell population was actually a conglomeration of different subtypes, with different properties and different patterns of gene expression. "We might have to transplant over a hundred individual cells into as many worms to find one that is truly pluripotent and can regenerate the organism," says Sánchez Alvarado. "That's a lot of work, just to find the one cell that fits the functional definition of a true neoblast. And if we want to define it molecularly by identifying the genes that cell is expressing, we have to destroy the cell for processing. There was no way to do that and keep the cell alive to track it during regeneration." Sánchez Alvarado and his team began searching for a distinguishing characteristic that could identify this elusive cell ahead of time. One feature that had long been used to distinguish neoblasts from other cells is a stem cell marker known as piwi-1, so Postdoctoral Research Associate An Zeng, Ph.D., decided to start there. First, he separated the cells that expressed this marker from those that did not. Then he noticed the cells could be separated into two groups—one that expressed high levels of piwi (aptly called piwi-high) and another that expressed low levels of piwi (called piwi-low). When Zeng studied the members of these two groups, he found only those that were piwi-high fit the molecular definition of neoblasts. So he discarded the rest. "This kind of simultaneous quantitative analysis of gene expression and protein levels had never been done before in planarians," says Sánchez Alvarado. "We could not have done it without the amazing scientific support facilities here at Stowers, including molecular biology, flow cytometry, bioinformatics, and imaging groups. Many researchers had assumed that all cells expressing piwi-1 were true neoblasts, and it didn't matter how much of the marker they expressed. We showed it did matter." "We have enriched for a pluripotent stem cell population, which opens the door to a number of experiments that were not possible before," says Sánchez Alvarado. 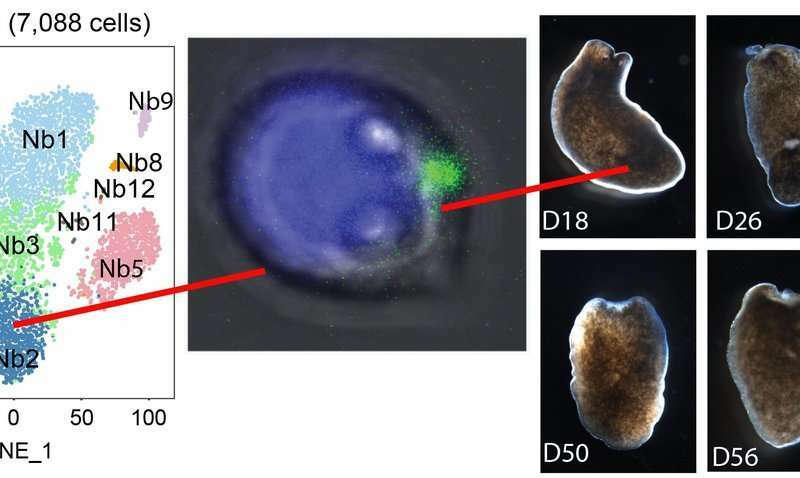 "The fact that the marker we discovered is expressed not only in planarians but also in humans suggests that there are some conserved mechanisms that we can exploit. I expect those first principles will be broadly applicable to any organism that ever relied on stem cells to become what they are today. And that essentially is everybody."